But nothing could be further from the truth—especially on the court, where what doesn’t kill you only makes you stronger. 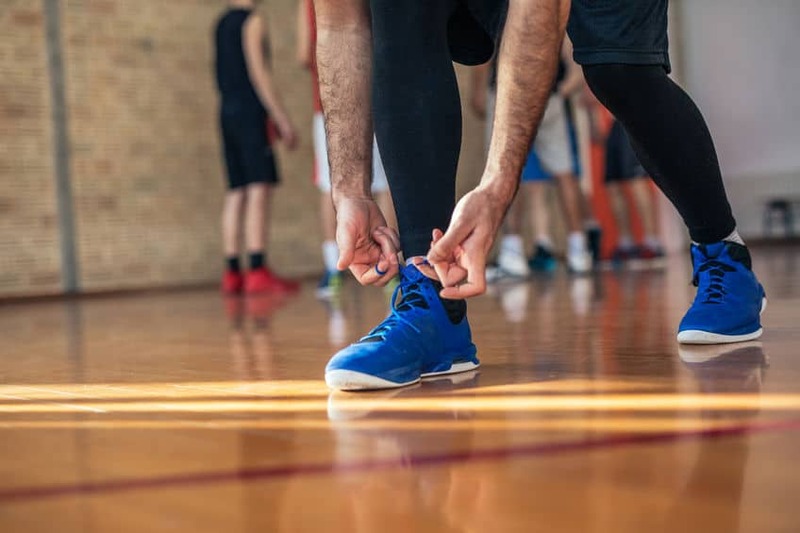 And with the aid of a great pair of basketball shoes that work best for those with flat feet, there’s no need to doubt yourself during your next matchup. Yes, there are some differences to your playing style to consider—and you’ll be wanting sneakers to accommodate your nuances—but you can absolutely excel with the right features at your foundation. 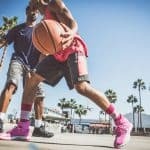 So let’s dive in and take a look at the best basketball shoes for those with flat feet. 6. 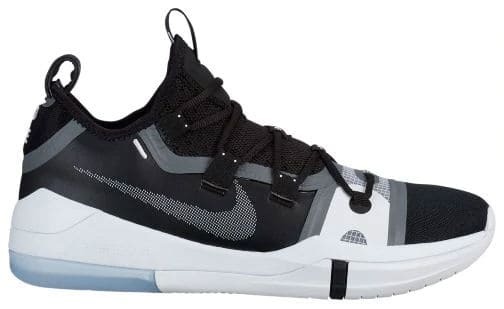 Nike Men's Kobe A.D. Putting aside his interest in “flat earth,” Kyrie Irving’s signature line of sneakers have something to offer for those with flat feet. These things are stunning—both in aesthetics and in functionality. Let’s start with the looks. You’ll appreciate the edgy yet rounded appearance, where the upper coasts up towards your heel, while the sharp “teeth” design across the sole reaches up the side. The large Nike logo is emblazoned across one side, while a unique traction pattern underfoot serves both a visual and functional purpose. The light and mesh upper assures great breathability while maintaining your speed as much as possible. A great lacing system bows up the top for a balanced, secure fit. For the flat-footed among us, there is so much to appreciate here. First, Zoom Air units across the heel help to improve your balance while also providing necessary security upon landings. The feeling of fit and snugness is enhanced thanks to the flywire cables. In terms of traction, there are micro-tread features embedded into the rubber sole that combines a jagged pattern with a large zig-zag stretching from heel to toe. 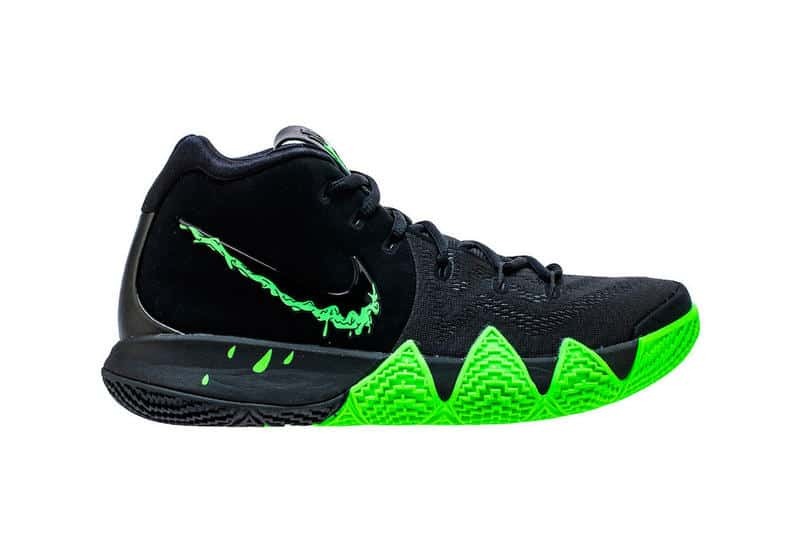 Nike Kyrie 4 is a fantastic option in general and certainly provides great support for a myriad of needs. 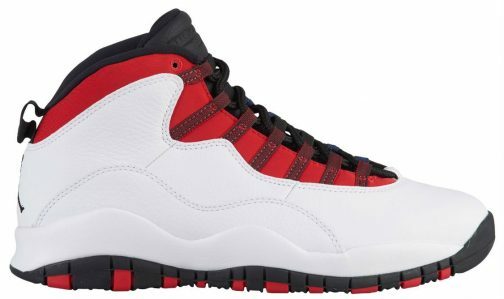 The Jordan Retro series has made a name for itself for a reason. You’re getting a great combination of edgy design and functional support—in all the areas that matter most. In terms of looks, you can feast your eyes upon something that is both subtle yet bold. The colors can vary from shoe to shoe depending on your personal preferences, but the actual cutout itself—especially the arching upper—provides a beautiful statement on the court. But for those with flat feet, let’s cut right to the chase: how well does this perform under your feet? Well, you can rest assured that you’ll be supported where it matters most. An EBA midsole provides the necessary comfort and rigidity while jumping and landing. Similarly, the TPU lacing system helps keep your overall foot secured. Thanks to the AIR system embedded in, you won’t feel left behind in the comfort department. Additionally, dashing off landings will feel natural and supported throughout. A nice little touch is the pull tab around your heel, allowing for easier on/off fittings. Top it all off with the iconic Jordan logo on the heel and across the tongue, and you’re ready to compete like never before. 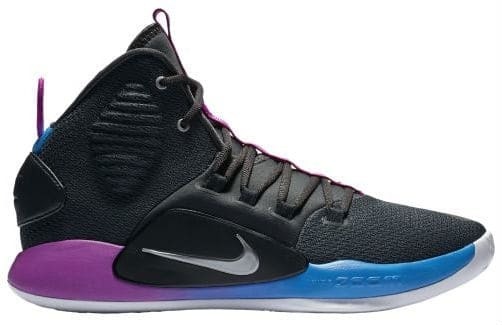 The Nike Hyperdunk X Mid provides an incredible support system for those with flat feet. In some ways, you might find yourself at a superior advantage despite being flat footed once you strap this pair on. Simply put, it’s got a straightforward design that gets the job done. Zoom Air elements will have you running on clouds with a support and cushioning system that is unparalleled. Adding even more to your overall sense of comfort is the upper itself, comprised of a textile and synthetic combination. As the design itself suggests, there is complexity within that could be overlooked. Aesthetically, the Nike Hyperdunk X appears simple on the surface. However, upon closer inspection you find that the humble appearance is just a cover for something much more special. Referring back to the Zoom Air elements, these are located specifically within the forefoot and heel. Support for your feet could rarely feel any better, especially considering the quality of traction right beneath that. The outsole is comprised of an abrasion-resistant material, lasting long for both indoor and outdoor use. Lastly, the Hyperdunk series prides itself for offering excellent support for running, which is essential for the flat-footed among us. It’s a unique name for a unique looking pair of sneakers—“why not” suggests the boldness of those willing to wear such an iconic pair. Why not wear something that has all the essential functionality with all the bold styles and colors you could want? 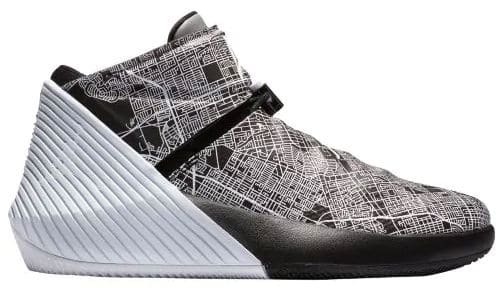 Aesthetically, this Jordan-inspired pair looks like a futuristic spaceship combined with a modern art exhibit. The heel is adorned with beautiful paneling that is both edgy and cutting-edge. The forefront/upper, however, contains a more flaring and free-flowing artistic touch with many colors. You’re left with a truly fashionable statement—but what about functionality? Simply put, you’ve got full-length Zoom Air units beneath your feet. It’s a bold approach that’s worked on many other pairs before it—and after—and for good reason. As far as comfort and stability is concerned, the Zoom Air units will provide you with all the stability and foundation you could want—especially during jumps, landings, and takeoffs. Referred to as “strategic cushioning”, the Jordan Why Not Zer0.1 truly does provide the kind of support you need, flat-footed or otherwise. 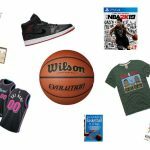 Michael Jordan is an iconic figure who dominates the history of basketball—past, present, and future. So it’s very fitting for a man of his fame to own a signature line, because Jordan can certainly own a wide range of fashion and styles. 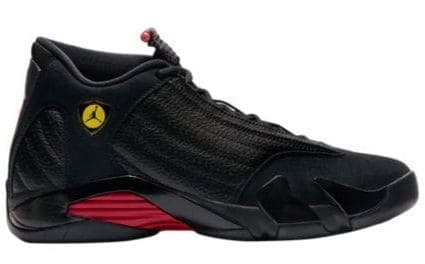 The Jordan 14 Retro provides you with a classic look while harboring all the essential modern functionality you’ve come to expect. In terms of looks, there are a number of color styles to choose from. The upper is comprised of a combination leather and synthetics build, while a 7-hole lacing system ensures you’re both secure and comfortable. Across your heel is the Nike Jordan logo with the number “23” beneath it. As far as support goes, your ankles will appreciate the padded buffering that’s provided, allowing you to move with great agility without feeling sore or blistered. A carbon fiber shaft also keeps things cool and breathable while also adding to the support structure around your feet. The midsole is comprised of the phylon material, which is great for enhancing stability and plushness. 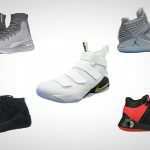 A Zoom Air unit is included for an additional layer of support, and just beneath that is a Herringbone-patterned outsole to keep you glued to the court. Collectively, these features work great for flat-footed athletes. Kobe Bryant is another king of the court and his signature line of Nike shoes is no exception. The A.D. series is particularly special in the foundational support department, which is a great plus for those with flat feet. Aesthetically, it’s got a pretty simple look that’s low-key and humble. This is greatly contrasted by the high-tech features that lay a stunning foundation beneath your feet. The upper is comprised of mesh booties for half its span while flywire cables maximize snugness. Security and fit are a top priority in this pair which is great for those with flat feet—as long as the foundation is good, however. Thankfully, the Nike Kobe A.D. provides an incredible foundation that does not fail to meet these criteria. Take, for example, the lunarlon foam across the midsole that absolutely conforms to the shape of your feet while ensuring maximum support. Landing from even the highest jump shots with this pair is effortless, including those all-too-essential takeoffs. As if this wasn’t enough, there’s also a Zoom Air unit in the heel, giving you that incredible feeling of responsiveness and support. In all, this is a pair that delivers on all fronts with great reliability. The King himself cannot put his name on a pair that doesn’t offer the absolute finest in basketball sneaker technology. 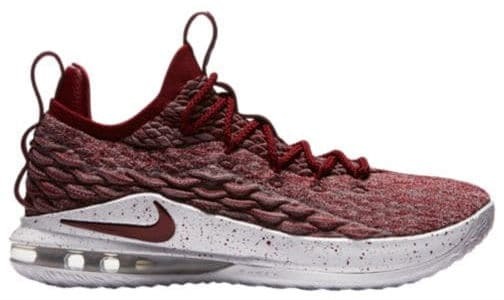 Indeed, if you’ve got flat feet and want to excel on court, the Nike LeBron 15 Low offers a wide range of features to enjoy. Aesthetically, you’ll be greeted by a flamboyant appearance---but don’t let that distract you from its straightforward, functional tech. The upper is comprised of a flexible, breathable material held together by a unique “netting” that handles both support and flexibility. Of particular importance to note is the use of Flyknit—or specifically the newer generation known as BattleKnit. This, along with the Zoom Air units for lightning fast and responsive cushioning, creates an unbeatable combination. As far as comfort is concerned, you’ll be pleased with the full-length inner sleeve that’s only further enhanced by the inclusion of flywire cables to ensure greater support and fit. Puma has offered some unique basketball shoe options before, but few are as special as the Clyde Court. For those with flat feet, there is plenty to love here. Let’s start with the HYBRID Foam Technology that’s embedded into the midsole. Utilizing a combination of Puma’s patented “IGNITE” and “NERGY beads”, you are given a support system that’s unrivaled by many other designers out there. 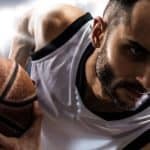 The IGNITE beads are designed to maximize energy return, meaning landings and takeoffs feel more like an extension of your skill set rather than a necessary burden of the game. The NRGY beads, however, provide the real support foundation, offering your feet incredible cushioning. Adding to the sense of security is the external heel counter so you’re never left feeling loose and vulnerable. An inner-sleeve fitting and unique lacing system helps ensure that you feel both agile yet cozy, with maximum breathability for a shoe of this style. The aesthetics are also pleasing to the eye, with varying color schemes and the low-reaching lacing system offering a nice touch. 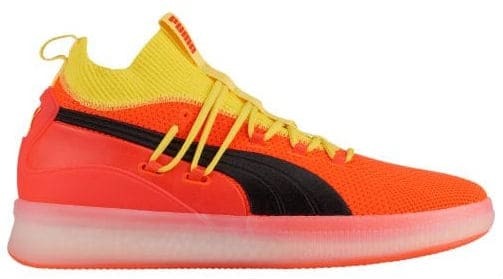 If flat feet is an issue you’ve struggled with on the court, the Puma Clyde Court is an exceptional option to consider. If you’re looking for a great combination of a fashion statement and functional essentials, the Adidas Dame 4 is a great choice. Fashion wise, you’re getting a stylish take that’s both fashionable yet edgy enough for the most competitive on-court play. The lacing system ensures great support while also matching the overall style, reaching high up to the tongue emblazoned with the Dame logo. The heel features a strap for easy fittings—both on and off. With an upper that is both light and breathable, you are in for a comfortable experience that also provides exceptional support. The cushioning is top-notch with great added support for lateral movements and acceleration. Included in the package is bounce cushioning that will make your feet feel truly engaged and secured during the most heated moments. Ensuring additional comfort is the neoprene collar that provides a soft and comforting sensation. Finalizing the entire package is a rubber traction base that’s secured by a tread pattern so even the flattest feet are sustained during intense movements. 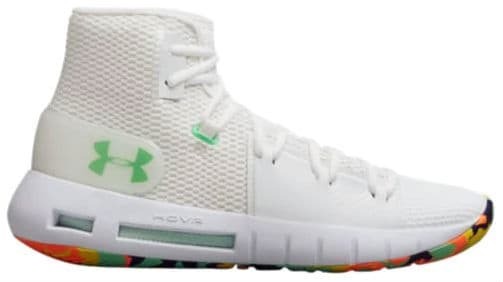 Providing some of the most elaborate yet elegant technology for support and performance, the Under Armour HOVR Havoc lives up to its name. “HOVR” across the court thanks to its lightweight and breathable mesh upper, along with the use of the patented HOVR foam offering a zero-gravity feeling. Reek “Havoc” across the court thanks to a stunning foundation of TPU shank wraps across the midfoot ensuring maximum stability for lateral movements. An EVA sockliner ensures additional comfort and support beneath your feet, and even the lacing zones on the upper are strategically designed to create the ultimate structure. 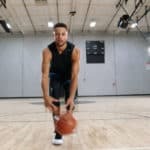 Thanks to the Energy Web compression mesh, the energy you put in goes right back out into your next movements, keeping you fluid on the court. A herringbone pattern across the rubber sole ensures that you have all the traction you need during even the most intense moments. Staying lightweight, this pair provides incredible support despite its weightlessness—a great option for those with flat feet.